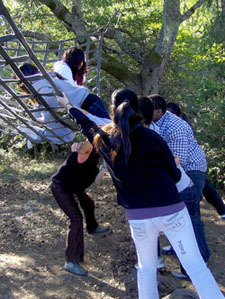 Four Winds ropes courses are designed by experienced leaders to maximize the excitement and minimize the risk. Our leaders work hard to ensure that everyone is safe while challenging themselves and having fun in the process. 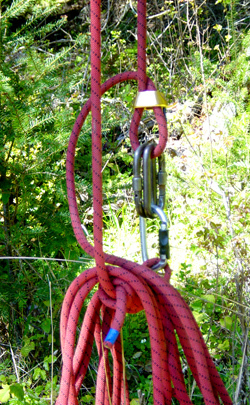 belay devices, harnesses, and helmets each year, along with all components of each activity. On Saturday, December 6th, the Youth Fellows woke up early to travel an hour-and-a-half outside of the city to Four Winds near Bodega Bay for their annual Fall Retreat Ropes Course. The Youth Fellows were divided up into six traveling groups of both East Bay and San Francisco students and transported by mini-vans driven by Coro staff members and chaperones who are in the Coro Fellows Program in Public Affairs. It was a beautiful drive that gave the Youth Fellows a chance to connect with their group members from the other side of the Bay, meet their chaperones and experience the rural country side. The group arrived at the Four Winds Ropes Course just as the fog lifted and the sun came out. They spent the rest of the day working with the highly experienced Four Winds Teambuilding and Leadership Training Staff who were incredible outdoor educators. The Youth Fellows worked together to overcome their fears and push their limits by participating in games , initiatives, and ropes course challenges that were interspersed with periods of reflection and discussion. Some activities were near the ground on cables, nets and platforms and challenged the Youth Fellows' critical thinking and teamwork skills. Later in the afternoon the Youth Fellows got their adrenaline pumping on the "high ropes" challenges that involved trees, logs, ropes, ladders, zip-lines, and nets suspended far above the ground. For many of the students, this was the first time they had participated in a high ropes course and some of the challenges forced them to step way outside of their comfort zones. The day concluded at sunset with a closing circle where the Youth Fellows shared thoughts about their Ropes Course experience. They then drove the hour-and-a-half home with a sense of accomplishment, group unity and the increased confidence to take on future challenges.